Co-operation and good will, that's how we get by in 99.999% of our lives. We don't live in an oppressive society governed by fear, violence and intimidation. We don't have security services and police on every corner, and the majority of police don't routinely carry guns. A good proportion of society support the police in their work. It's beyond argument that police make our communities better, and consequently when required, most of us are co-operative and helpful to officers. I won't say violent protest is never justified. Occasionally history has shown violence necessary in ending oppression. However in the case under question there is no such justification. Disliking laws passed by parliament in a reasonably democratic manner is no justification for hurling rocks at police, smashing public buildings and burning street furniture. Besides, it's the tax payers who will foot the bill - an ironic point, in a demonstration essentially centred on public funding. (I say reasonably democratic, as I acknowledge no democracy is perfect, but looking around the world I think we're in a pretty good shape). But whatever the justification through misbehaviour of protesters, the police and authorities must take a step back and acknowledge their own role in exacerbating what could now descend into a destructive cycle of violence. 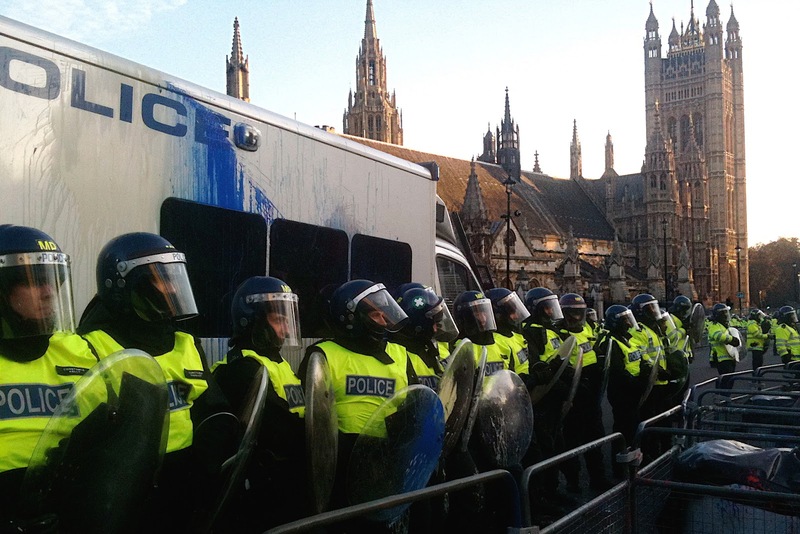 Many were critical of the police handling of the protest at the start of November, which also descended into violence when property was damaged at the headquarters of the Conservative party. I however supported the police tactics. Whilst it could be argued the police had failed in their aims to protect property, there were relatively few credible allegations on blogs and message boards of provocation or brutality from the police. Furthermore, the wider community were rightly outraged by the violence and dangerous behaviour, symbolised by one protester putting lives seriously at risk by hurling a fire extinguisher off the roof of CCHQ. The outrage lead to a media campaign to find the culprits. The Twitterati, sometimes sceptical of mainstream media and authority alike, were happy to help distribute images of the wanted. In short - the police lost the battle, but won the hearts and minds(!). Skip forward to the next protest. Police, eager to avoid criticisms levelled at them after the first demo, hit back. Digging out the kettle from the police armoury. Obviously some commanders still believing that depriving ALL protesters - the non-violent majority as well as the violent minority - of their liberty is a top plan! Kettling, coralling, containment; whatever you want to call it, is wrong on so many levels - not least of which shown by yesterday's destruction: it simply doesn't work. It failed to protect property, and failed to prevent disorder spreading elsewhere. Whilst massive police resource was deployed in parliament square, blocking exists and forming a cordon around the Supreme Court and busted doors to the treasury, disorder spread to Oxford street, and Charles and Camilla's car was attacked. But yesterday's demo was notable for another reason. I saw quite a lot of talk on twitter and blogs used by the protesters of tactics to avoid kettling. A Google map was created so those using smart phones could share locations of police blockades to assist in what some called an attempt to "kettle the kettle" - to encircle the police encircling the protesters. It is probably safe to say the kettling tactics deployed on the 24th November, when school children were detained for many hours, did a lot to stoke anger in an already volatile aggrieved section of society. In short, in the second battle, the police appeared to win the day, but the protesters came back stronger. I'm no expert in police tactics, but I'm vehemently opposed to mass detention except as a very last resort. Surely police commanders should be encouraged to keep the protesters moving - round the streets in circles if necessary, allowing those bored to drop out, rather than confine many thousands of innocent peaceful protesters along with the violent minority. I'm not denying violent disorder is an extremely serious situation. The police are faced with a very difficult job. But the long game is restoring order, and everyone at all ranks should remember that. Despite the animals misbehaving, it might not be the best option to carry on prodding the already agitated beasts. One can't help feel that kettling is being used not as a tactic of last resort but as a deterrent and a punishment. To punish those who dare to protest, in an attempt to deter further protests. I'm seriously concerned that repeated use of this tactic could lead to a downward spiral of violent protests. There's already talk of a new protest against kettling. And those showing an interest in such a protest come from a far wider cross-section of society than the student protests. Another cause of public anger is of course the disgraceful horse charge against protesters. A police spokeswoman justified this by claiming protesters didn't stick to the agreed route, and threw snooker balls and other objects at police. Again two wrongs don't make a right, and if the situation is to improve, someone has to take the moral high ground and refrain from retaliation. The spin issued by senior officers from the Met just doesn't cut it. What's an agreed route to a disorderly band of angry students? Is our right to protest against the government limited to only what police agree to? Of course it isn't. Peaceful protest must be facilitated in all forms. The police with helicopters at their disposal could surely have foreseen problems, and altered plans accordingly. Plus it was somewhat inevitable that the protesters would focus on parliament square, since they tried - but mostly failed - to get there on the demo on the 30th November. And, having been hit by a snooker ball in a pub riot in Halifax as a youngster, it's not fun. But I wasn't wearing full armour - as nearly all the police I saw were. And whilst this made a good headline, I can't imagine that many students thought to raid pool tables across the land for such missiles in advance of the demonstration. Maybe one or two were thrown - is this the extent of media training for senior officers? Yesterday the police came under extreme provocation. They had a thankless task to complete. But I'm urging the police to take a rational approach. To avoid kettles at all costs, as they only serve to increase anger and frustration. To avoid charging with horses at protesters, as this is a serious risk to life and extremely cruel on the horses. And to avoid spin in their attempts to justify their actions. The tactics deployed yesterday only server to forment anger. Retaliatory tactics will not help maintain long term order, as they destroy the co-operation and good will I mentioned earlier. It is not a role of the police to punish those who break no law in their choice to protest peacefully by detaining them of their liberty for 8 hours. Good blog, agree with most of this (except not sure this law has democratic backing when 60% of the votes went to parties opposed to such an increase). I fear as you do, this is just the start of more, bigger and more violent protests and police responses. A very good post. You have correctly spotted the issues, that firstly, "Two wrongs don't make a right", but primarily, that the police and the authorities are the ones with the responsibility to break the cycle. They are, if you like, the 'grown ups' in all this - many of the demonstrators were under eighteen and very angry. Thank you, you've managed to say what I want to in 140 characters! It's a mess that's for sure. Yes, we should look to our police to keep law and order but their silly tactics have backfired, the reason the demonstrators didn't stick to the route was because they were afraid of kettling & who can blame them? I saw the twitter posts of a number of people on Westminster Bridge last night & was genuinely afraid for them and couldn't work out what the point was. Was it until the Royals got home, retribution, muscle flexing - what? There didn't seem to be a good reason because many were on their way back to coaches to take them away. It's not only the Royal Family who have a right to be protected, nobody took into consideration the welfare of those kettled, a number of whom were school children. I've been (unintentionally) in a much smaller but similar situation to yesterday and it was terrifying. I taught my children to respect the law and the law enforcers but now, at 43 years old, I'm afraid of them. I realised in my situation that many officers had come pumped up with adrenaline, ready for action and at the slightest hint come out all guns blazing and when you are on the wrong end of that it's a frightening experience and one that I never want to revisit. I marched in Leeds on Wednesday for education for all regardless of class or financial situation because I feel strongly and I have a right to do so. I was fortunate to join a very peaceful demo but pulled back at each (jovial) confrontation because I know what can happen. Violence in any situation is wrong, peaceful protest is the only way. Unfortunately, the size of a demo like this also attracts rent a mob and sadly that's what make the headlines. I am heartened that the young have once again become politicised and engaged with what is happening and smiled to see them speak with such eloquence on the news over the day so lets not tar them with the same brush and for God's sake please let people see through the headlines to the real issue. Do you really want our politicians to be honest? Live-tweet tedium, but what else can one do?